Tragically, we lost one of our Madison Park dogs last summer due to complications from a heat stroke. Summer heat is most serious business. 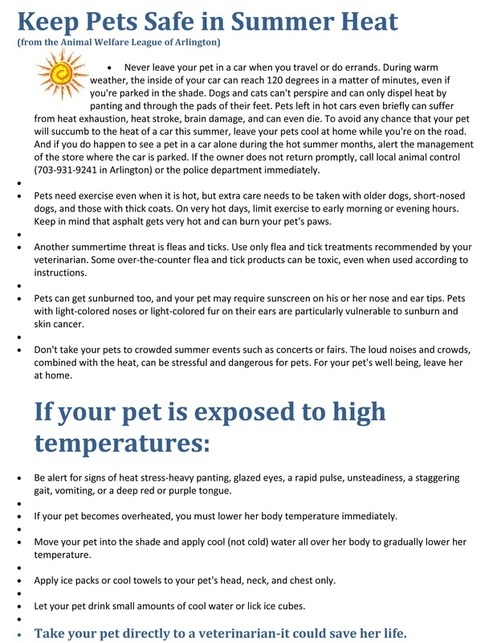 Please read the flyer about heat stroke and watch your dog carefully. Know what to do if he shows indications of heat exhaustion. There is a box in the shed containing items you can use to bring your dog's temperature down. Once his temperature begins to drop, get him to a veterinarian as soon as possible. Even if he appears to have recovered fully, he needs to be examined to determine if there is damage to his kidneys and liver. The effects of heatstroke can continue for 48 to 72 hours. An abundance of caution is indicated. Dogs are far more susceptible to overheating than human beings. PLEASE KEEP YOUR DOGS COOL.